At the end of the first day in Cairo, we took an overnight train to Aswan. An overnight chair-car in a vehicle which goes into a vibrating trance every few minutes was not what the body was crying for having spent the previous night in an equally annoying aeroplane seat. But at least it brought us to Aswan with enough time to spare on the following day for sightseeing. The two days in Aswan - outside one crazy afternoon on the Sahara dunes - were easily the hottest days on our trip. Almost all of us were dehydrated by the end of our stay. On the first scorching day, we covered the Unfinished Obelisk, - abandoned due to a flaw in the stone, although I sincerely think that the entire crew would have vapourised in the heat - the Aswan high dam, the Nubian Museum, and the island temple of Philae. 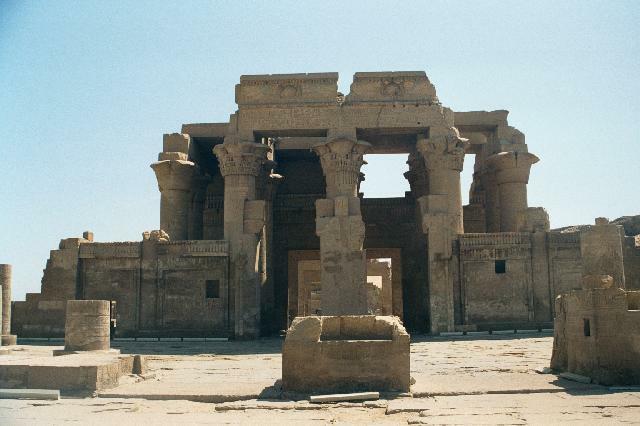 The Philae temple was easily the pick of the lot, its island setting adding to its beauty. This temple along with the pair in Abu Simbel were moved piece-by-piece to a fresh site when the Nile flooded the original location after the building of the Aswan high dam. The temple, however, looked twice as pretty under the lighting for sound and light show in the night. We had to get up at an inhumanely hour early next morning in order to catch the convoy to Abu Simbel. As a consolation for the early start we got to see a spectacular sunrise over a pretty dramatic desert scenery. The twin temples at Abu Simbel, dedicated to Ramesis, the great and his wife, Nefertari, were easily the best among the monuments we saw during our trip. 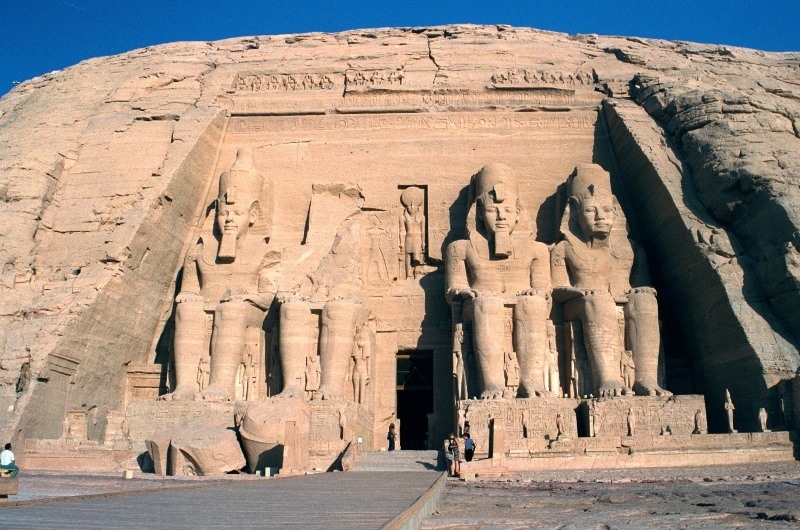 The four 20m tall statues of Ramesis, staring coldly at Nubia across the Nile, were awe inspiring to say the least. Equally amazing is the feat how the temples and the mountain were rebuilt here after the Nile flooded in the '60s. The three of us and Melody were the only souls brave enough to spend one more afternoon in the Aswan heat, this time to visit some of its lesser known attractions. We started off with the Tombs of the Nobles, which was worth the effort for the bird birds eye view we got of the city. A distinctly uncomfortable 30 minute camel ride from there brought us to the San Simeon monastery, a 7th century monastery destroyed by Salah al-Din during the crusades. 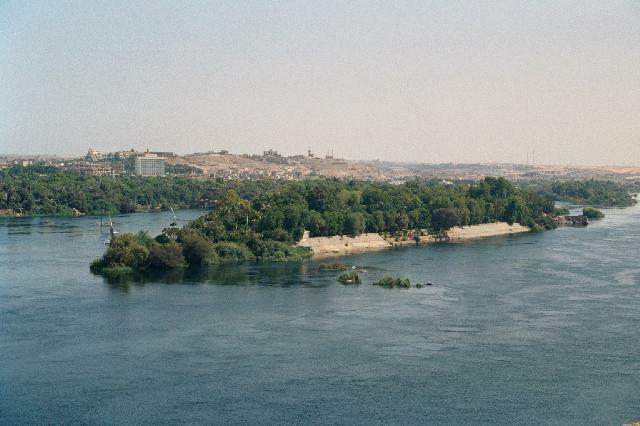 Aswan also has two islands : a smaller "Kitchner Island" which due to the work of a British General, Kitchner, is entirely dedicated to some exotic plants and a larger "Elephantine island" which contains a ruined temple. We walked through the former and floated past the latter to bring our afternoon adventure to a close. We spent the next three days and three night floating down the Nile - from Aswan to Edfu - on a felucca, a lanteen-sailed boat introduced by the Romans. 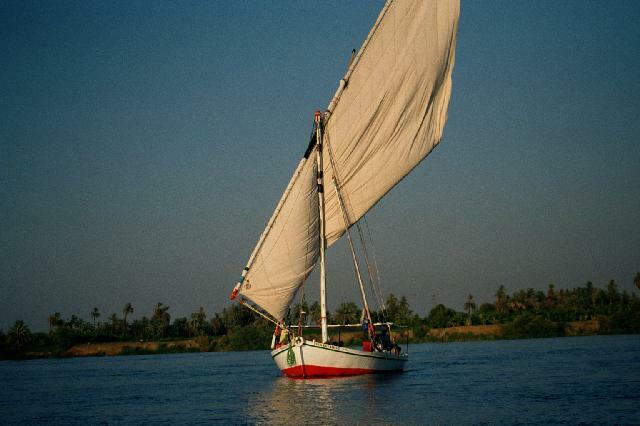 After five days of sleep deprivation, three days on a felucca was exactly what the doctor ordered for us. The antics of Mohammed, the captain of the boat, ensured that we were never bored and his cooking skills ensured that we were never hungry during our trip. It was a pity that the heat had taken its toll on Bec and she couldn't join us on the boat trip. The temples of Kom Ombo and Edfu were the big stops worth mentioning on our trip. The temple of Kom Ombo sits right on the banks on the Nile and is perfectly symmetrical about its centre and hence contains two temples in one. The one on the left is dedicated to Horus the elder (the brother of Osiris) and the one on the right is dedicated to the crocodile God, Sobek. The temple of Edfu is dedicated to Horus the younger (the son of Osiris) and is one of the best preserved temples in the country. The temple is the site of the famous battle between Horus and his evil uncle Seth, the slayer of Osiris. The reliefs of the temple show many hippos being killed during the annual ceremonies to symbolise the defeat of Seth, who used to take the form of a hippo. Edfu actually is the farthest from Aswan a tourist is allowed to wander on a felucca after which one is forced to take a mechanised means of transport. By covering 100 odd kms over 3 days, the feluccas are not the fastest way to travel in the Egypt, but it definitely is the best way to enjoy the changing moods and scenery of the Nile. Click here for more photos from Aswan and Abu Simbel. 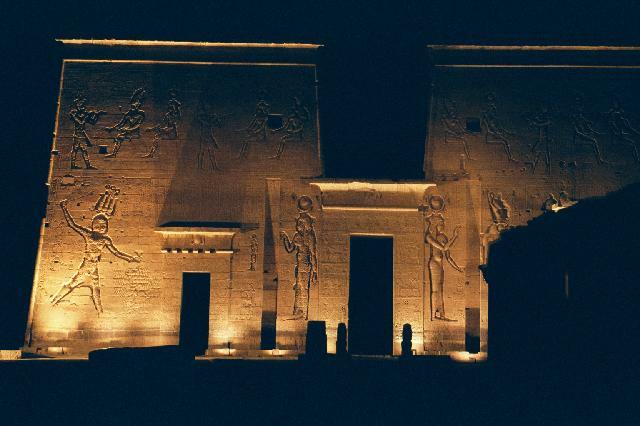 Click here for more photos from the Felucca Cruise, Philae, Edfu and Kom Ombo.